In order to appreciate something it has to be known first. Do we know the history of Seville’s water supply, and our heritage as related to water? Water and city have been conforming throughout history and the different Civilizations, a rich and diverse heritage that reaches to our days. Infrastructures, monuments, fountains, architecture, aqueducts, art … culture. They are the traces scattered throughout the urban weaving, legacy of a monument and cultural heritage immensely valuable for Seville and its inhabitants. EMASESA, the Metropolitan Water Supply and Sanitation Company of Seville,has designed four routes through the city to highlight the monuments related to water. We invite you to know our heritage in a new way through the realization of these routes.The routes have an added value: to promote the individual health of the people through the exercise of walking. The 4 routes designed (Blue, Purple, Green and Orange Route) containpaths of different lengths, adaptable to the needs and capacities of the different people, whose realization will favor the physical activity and the healthy consumption of calories by the participants. These routes are provided with drinking fountains. A new and healthy way of knowing our wealth wealth, through the exercise of walking. The people who wish to participate in these guided routes that will be carried out from the 18 to the 21 of September can request it through this . The requirements are to be of legal age and have a physical form that allows the performance of the activity. Once made known, they can be done individually with an app or with the indications of the drop down map that would be provided in EMASESA and will be distributed in selected points. 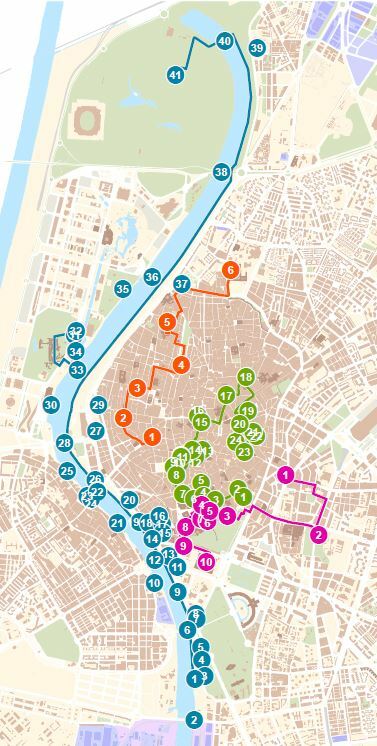 The information on the routes will be permanently available on the EMASESA website for citizens, associations, groups of friends, tourists and anyone interested in knowing the history of water in Seville at the same time as a healthy activity such as walks to Walk through the city. 9 St. 12 St. 14 St.
• The urban structure of the old town, as well as in areas of new extension. • Traditional construction methods, typology of dwellings and materials of the area. • The vegetation and fauna in the urban environment: parks, walks, birds, reptile mammals. 1. DRINK WATER. Do not forget to bring a botle of water with you at all times. It is basic to drink at least two litres of water per day, even if you are not thirsty. Seville is quite hot and we should avoid dehydration. In each route there are some fountains with drinking water and refill your water bottle. 2. PROTECT YOURSELF FROM THE EXPOSURE TO THE SUN, especially at midday hours. Wear a hat or a cap, sunglasses with ultraviolet filters and comfortable clothes with light colours. Treat your skin with sunscreen. 3. AVOID WALKING LONG DISTANCES WHEN IS MORE HOT DURING THE DAY. If you want to go out to do some exercise is better to do it early in the morning or late in the evening. And do not forget to recover yourself after the exercise with liquids in a proper way. Share the post "The Water Routes"